Top lightweight prospect Mason Menard will face tough Bahodir Mamadjonov in a 10-round battle in the new co-feature of ShoBox: The New Generation on Friday, Aug. 19 from the outdoor soccer venue Rhinos Stadium in Rochester, N.Y.
Undefeated heavyweight Jarrell “Big Baby” Miller (17-0-1, 15 KOs), a consensus Top 15 heavyweight, will take on the experienced Fred Kassi (18-5-1, 10 KOs), of New Orleans, La. in the 10-round main event. 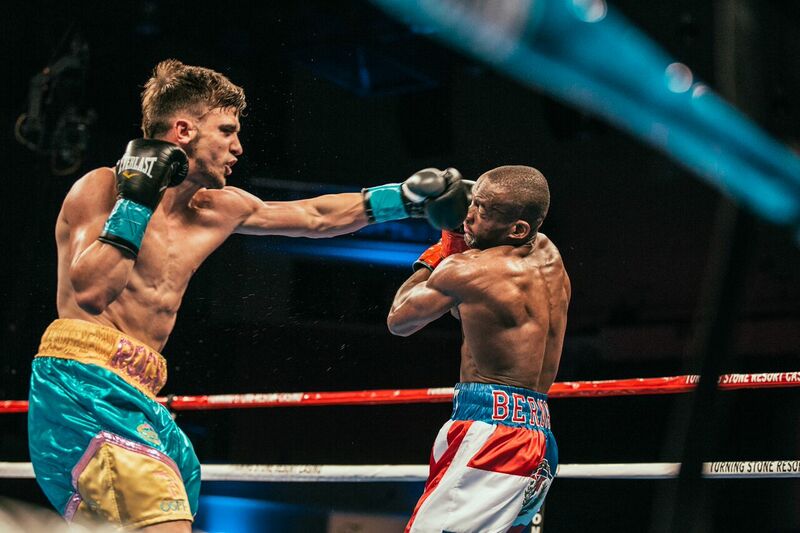 Plus, undefeated welterweight knockout artist Bakhtiyar Eyubov (10-0, 10 KOs), of Brooklyn, N.Y. by way of Kazakhstan, steps up when he faces veteran Karim Mayfield (19-3-1, 11 KOs), of San Francisco, Calif. in a 10-round battle. In the telecast opener, unbeaten Antonio Nieves of Cleveland, Ohio will square off against new opponent, Mexico’s Alejandro Santiago in a 10-round bantamweight bout for Nieves’ WBO NABO Title. Nieves was initially set to fight world-ranked Nikolay Potapov (14-0-1, 6 KOs), of Potolsk, Russia, but he withdrew with an injury. “I’m excited I’m fighting on ShoBox again. It’s a great opportunity” Mamadjonov said. “Menard is no joke. He’s a credible opponent. “I’m war-ready,” Nieves said. “I’m excited to finally showcase my skills on the big stage and let the boxing world know that I have graduated to contender. I feel many don’t see that I’m one of the best 118-pounders out there. “I’m confident I have what it takes to win, and I’m a better boxer. I’m 100 percent ready for whatever type of fight my Santiago brings. I will box my way to my big shots. “I know I’m a replacement opponent, but I’m always ready,” Santiago said. “I’m always in training camp. I don’t take any breaks from the gym after I fight. I’m a true Mexican warrior. Always ready. The co-main event features promising Louisiana lightweight “Rock Hard Mighty” Mason Menard facing his toughest test to date in Bahodir “Baha” Mamadjonov of Houston, Texas by way of Uzbekistan for the WBO NABO Lightweight Title. Both fighters are making their second appearance on ShoBox: The New Generation. Menard floored Bernardo for the first time in his career with a series of rights near the end of the second round. Bernardo beat the count and finished the round, but he had no answer for Menard’s power. With less than one minute left in third, Menard connected with a huge right, knocking Bernardo out before he even hit the canvas. Mamadjonov (19-2, 11 KOs), has been matched against very tough opposition throughout his career. His only blemishes were to opponents with a combined record of 46-0 (38 KOs) – Colombian Darleys Perez in Aug., 2012 and Ghana’s Richard Commey in April of last year. Perez went on to become interim WBA Lightweight World Champion and recently lost a rematch against world champion Anthony Crolla. Commey is set to fight Robert Easter Jr. for the vacant IBF World Lightweight Title on Sept. 9. Nieves, (16-0-1, 8 KOs), a prospect at 118 pounds, has stayed active with five fights in 2014, five in 2015, and is fighting for the third time this year. The 29-year-old is coming off his first 10-round performance, a unanimous decision over then once-beaten Oscar Mojica on June 18 in Washington, Pa. A win against Santiago will put Nieves a step closer to his goal of challenging fellow Ohio-native WBA Super Bantamweight Champion Rau’shee Warren. Santiago, (11-2-1, 3 KOs), of Tijuana, Baja California, Mexico, is a three-year pro who seldom breaks training camp between fights. He has won three fights in a row since his last loss in November 2014 to fellow Mexican Hector Flores. In his last fight on Feb. 27, Santiago won an eight-round unanimous decision over Mario Lara. This will be his United States debut and the first time he’s fought north of 116 pounds.